1. You First! : This tip is perhaps the most important one. It may be cliche, but as Carrie Bradshaw once famously said, you cannot love another person and expect to be loved in return unless you love yourself first! Wise words. 2. Don't Overdo It: While you may think that showering your guy with affection is the way to his heart, think again! Studies have shown that guys actually find it a turn off when girls give more than what he does because it turns them into more of a mother figure, rather than a friend or girlfriend. 3. And Action! : Sometimes it's nice to spice things up a bit, so why not choose a date more suited to him? Guys love action-packed activities, so next time you spend time together, let him make the suggestions! 4. Absence: You know what they say, absence makes the heart grow fonder! While spending lots of time together is a sure way to his heart, so is reminding him of how much he loves spending time with you! So every now and then, don't forget to take some time out to see your girlfriends or family. 5. Take it Slow: When it comes to the physical side of your relationship, the best advice is to take it slow and allow it to develop gradually over time. This allows the two of you to build trust, one of the most important aspects of love. 6. Keep it Intriguing: A woman's instinct is to share a lot all at once, so make sure you keep some intrigue! Men love a bit of mystery after all. 7. Two-Way Street: The reality is, you can't expect him to love you if you don't love him in return. Love is a two-way street, so make sure your desires are true, and that you don't simply crave the affection and attention of another. 8. A Man's Heart: The way to a man's heart is through his stomach, as they say. But the truth is, everyone likes to be fed! Serve him up a treat and watch him (hopefully) return the favor. Love is about all the senses after all! 9. Friendship = Key: While love and flirting are important, so is friendship! Love is about being best friends with one another too. 10. The Joker: Men know that women love a man who makes them laugh! If every time you see a guy and he makes you laugh, you leave him feeling good about himself. In turn, he begins to associate this feel-good rush with you, therefore leading to lots of love potential! 11. Confidant Woman: Relying on your man doesn't mean being a crumbling mess without him! Men are strongly attracted to confident women who know what they want and aren't afraid to get it! So give him reasons to admire you. 12. Reliance is Key: Showing him that you rely on him (not TOO much) and allowing him to also rely on you will do wonders for your relationship. This way you allow the bond to deepen, opening yourselves up for love. 13. Time = Love: Spend time together! If there's a mutual attraction to begin with, then the more time you both spend together will allow the two of you to become closer. 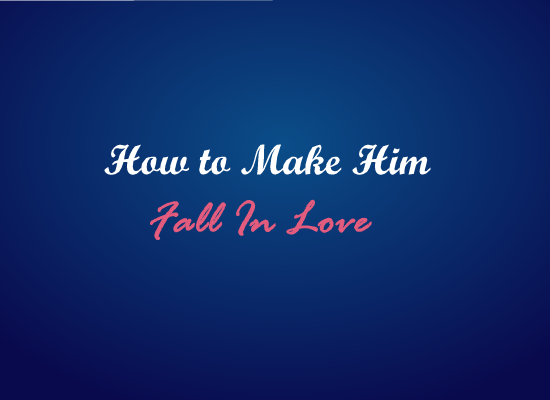 He'll learn to love one-on-one time with you. 14. Choose Similarities: Instead of dwelling on your differences, focus on your similarities instead! While sometimes you can benefit from trying new things to impress your potential lover, just make sure you don't fake interest! He'll be able to tell straight away. 15. Eye Spy: A US study has shown that lovers spend 75% of their time together staring one another in the eye. Ensuring that you give your crush eye-contact encourages him to look you in the eyes too, therefore encouraging his brain to think about love.